Learn killer licks in the style of your favorite players and jam along with our superb guitar jam tracks. 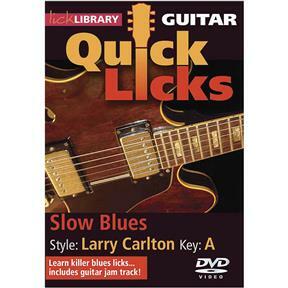 Each Quick Licks DVD includes an arsenal of licks in the style of your chosen artist to add to your repertoire, plus backing tracks to practice your new-found techniques! Learn slow blues licks in the style of guitar legend Larry Carlton, one of the greatest players of our time. Also includes blues jam track. Stuart Bull has taught tens of thousands of guitarists worldwide through the award-winning TOTAL ACCURACY guitar series.